When he’s released from prison after being framed for crimes he didn’t commit, a man teams up with his friend to get revenge on the evildoers who set him up. He’s had plenty of time to stew over this, so now finally is his chance to cross - one by one - the baddies off of his “Blacklist”. In the midst of all this, there’s some family drama, but all our hero wants to do is pound his cheating, lying, thieving enemies into submission with his Martial Arts skill. Will he complete his goal? Ninja Blacklist was a pleasant surprise. It’s actually a lot better than a lot of its “chop-socky” competitors. It has a very cool intro which sets the mood for the equally cool super-70’s vibe. This overall feeling maintains throughout the movie, making it an enjoyable experience and not a slog. You can tell a true filmmaker is at work here, with interesting and different lighting schemes, creative camera angles and editing, and awesome music putting the cherry on top (check out the main theme, which seems like it’s out of a Spaghetti Western - other themes have fuzzed-out funk that you can’t help but love). All this leads us to believe that if a widescreen, uncut, subtitled, remastered DVD came out, everyone would love this movie and give it a nice reassessment. As it is, it’s a pan-and-scan, dubbed abomination all too common with foreign films released at the time. While not a ninja movie in any sense of the word, and actually not Japanese, but a Hong Kong production, like so many other movies unrelated to ninjas, it got repackaged and re-released to cash in on the massive Ninja Boom of the 1980’s. As much as we love the Ninja Boom, the record must be set straight, and this is a stylish Hong Kong Kung-Fu movie, not a ninja movie. That being said, Ninja Blacklist overall seems influenced by some Japanese filmmakers, most notably Seijun Suzuki. Some audience members may be put off by the copious use of the zoom lens, but it’s a technique filmmakers used to use and it didn’t bother us. We’re hoping director/co-writer Mar Lo becomes a more well-known name in the West, and we’re definitely going to be looking out for more of his stuff. In the clothing department, there are a lot of great fashions on display. The movie is like a moving catalog of amazing sunglasses. 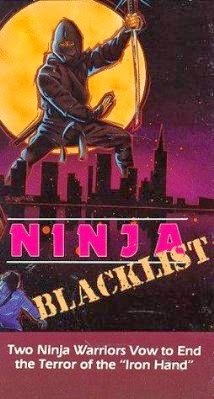 We definitely enjoyed Ninja Blacklist, despite its misleading title, because the movie has a lot of merit in its own right. 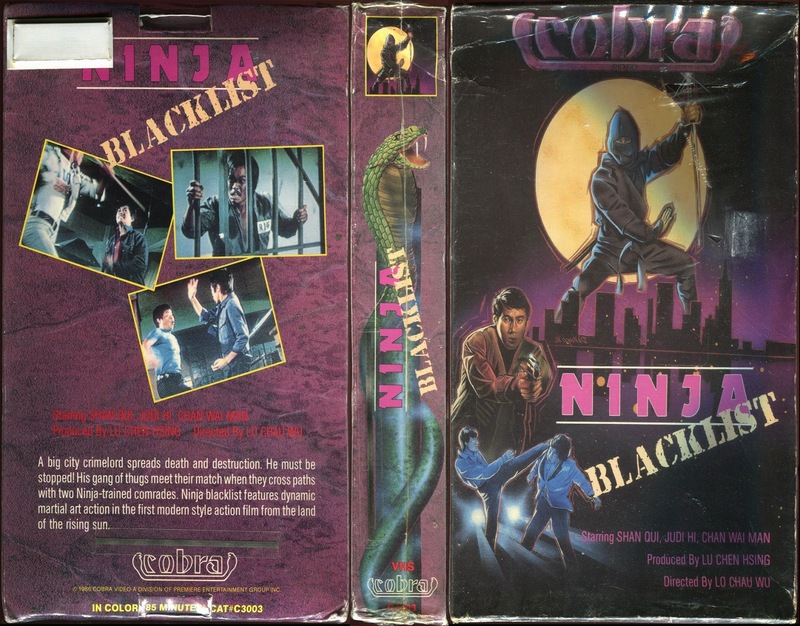 This is one of those undiscovered gems that, while Cobra Video tried to use it to cash in on the Ninja Boom, it got lost in it, and it’s time for a re-release so new eyes can see it. Also check out a review by: The Video Vacuum! I just watched this last weekend. The musical theme seems to be a Cantonese version of the Peruvian traditional El Condor Pasa. I completely agree with your review. It was much better than expected. My version was called Ninja Heat, which made it damned hard to find on imdb. Definitely an interesting Ninja movie. That's cool you have it under a different title.